The red light becomes more intense sometimes for a couple of minutes. When that happens I feel a kind of pain. I try to shut my eyes then realise they are shut already. There is no doubt of the beauty and power of this place. I can see I might come to love it here. The whole scene in front of me vibrates gently, everything slightly shimmers to a regular beat. Occasionally there’s a deeper red ribbon that flips into view. Looks almost like a bridge. No that can’t be right. There are no bridges here, no recognisable structures. Just shades of red moving before my closed eyes. There is sound here, a distant drumming and a sort of burbling. There are some deeper noises too, dark bass notes throb to a longer, slower beat. At first I thought they were random but I have been here long enough to start to hear the pattern. How long have I been here? Days? Weeks? I struggle to remember what those words once meant. Time does not exist here. It seems that all there is now, all there ever has been, all there will ever be, is the red and the gentle drumming. I move, twisting and turning, pushing against the red that surrounds me. Was it always so cramped here? Surely once there was space to move, to swim in a vast red ocean? Wasn’t I a mermaid, swimming and diving for the sheer joy of the movement? Now though I feel constrained, the sounds louder, the red closing in on me. Now it feels hot, my skin burns and itches. I’m gasping for words that are vanishing before I can catch them. My words are rushing away from me, all that is going now. Soon there will be nothing left but the, oh what? What is it called? that colour that is all round me? Nothing left but that and and the pounding, pounding, pounding. This is two days of the 30 minutes-30 days challenge, blended with Jani Franck’s Creative Beings. prompt to have a Red Day and immerse in one colour for a day. Raw Art Lesson 9 part 1. While in Spain I went to Finsterre. This is a photo of the view looking out from the very tip of the Cape. It is totally unaltered(!) I took it partly because I knew we’d be doing something like this in the workshop. The words down the side are the names of the shipping areas. 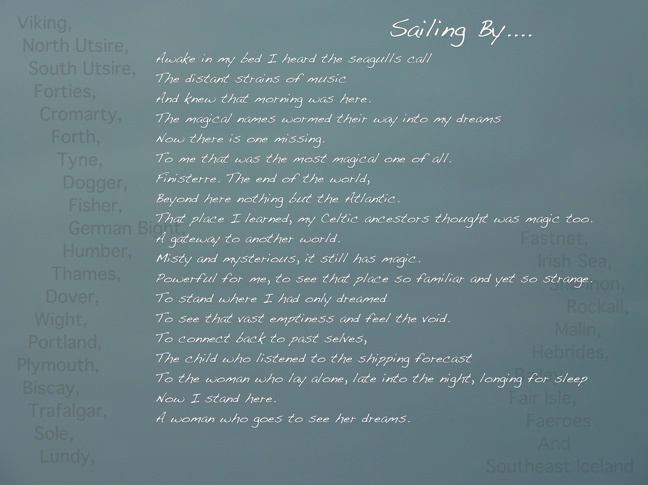 Three times a day BBC Radio 4 broadcasts a shipping forecast and it has done so all my life. In 2002 they changed the name of the Finisterre region in the forecast to Fitzroy but the damage was done. I had to see it! I’ve been writing mostly today, article for link backs to one of my main sites. Re-working old blog posts into fresh. Makes me think of spinning straw into gold LOL. All this writing got me thinking about my own short stories. I have a stack of them and I’ve always meant to do ‘something’ with them. Today I sat down and re-read them. Amazingly I still like them and think that other people might too. So what to do with them? Posting them on the blog isn’t quite right. They wouldn’t happily fit into the blog format and yet I find I would like to publish them somewhere online. If for no other reason than to preserve them. At the moment they exist only as printed copies. Andy suggested making them into pdfs that people could download and read. I’m not sure anyone would ever bother but it’s a semi- attractive notion. Anyone got any good ideas?